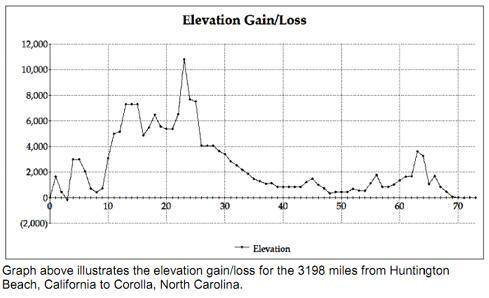 Below is a graph from our ride across America in 2009. It starts in Huntington Beach, CA and passes over the Rockies (highest point at Wolf Creek Pass, 10,800 ft) before settling down to Kansas and Missouri... and then the Appalachians before getting back down to sea level. We can't wait to provide a similar graph for the Americas! See our summary for the 2009 ride across America. Elevation by day with highest point at Wolf Creek Pass in Colorado at 10,800 feet. See our summary.